I’m taking them to the beach! 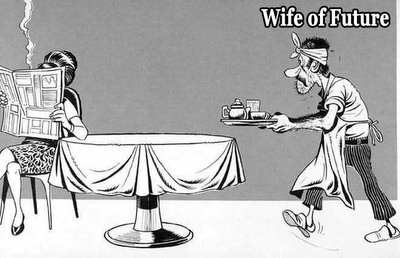 so so near to true because in future womens are coming to lazy to do work specialy in asia they are going to like jobs so wife wil becom manager and husband will become as servant in rich families girls nothing knows to do any thing without there beauty and fation and modeling so husband will kiss the model and prepare the tea. 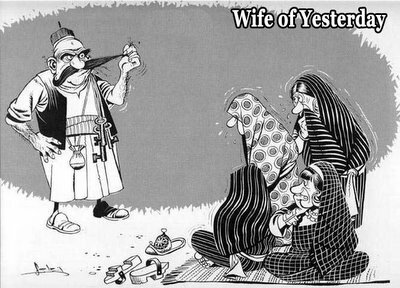 In my own country and in my own culture, I doubt so much if wives will ever be like the wives of tomorrow. Perhaps the painter has painted his nightmare! Emancipation of women does not make a woman the head of the house. Women can be at high places but women should not be given absolute power. They may not be able to control absolute power. I support women power, but not like in what we have above. Running away from the fact is deniable to the solution of problem or circumstances at hand,a problem identified is a problem half solved; Lets not run from the truth for the above picture rightly gave us the true photos of the past,the present and the future of our women presently.To be very honest with you our future women will be 100% worst that what we see in that picture with what is going on today with our self proclaimed modern wives- may God have mercy upon man kind. I will advice that they should all learn from the Bible (Proverbs 14:1)that is the only way out for them. MY DEAR MEN WE BETTER WATCH OUT BEFORE WE GET PREGNANT!!! Even i think dat it’l b true in future bt i shldnt b.. So boys! Do look 4 innocent girls to marry. this is not only a joke but this is reality. It’s so ridiculous.In recent times it has become a cosmopolitan fashion. God ave mercy!! it,s abomination guys were in trouble even them who r in hse of God r worse they r pretenders better 2sty single from kenya. In fact this is very through with this emancipation exercise going on…. 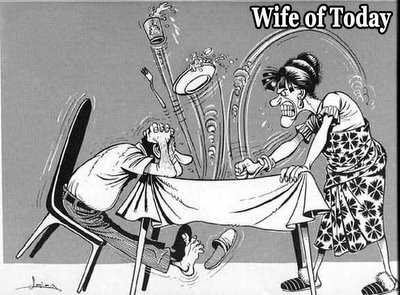 I don’t understand why men, especially unmarried boys always spread such negative rumors about marriage. What’s wrong with girls? They are not that much bad as boys or men. Go to any office, most of the little office politics are played by men, not women. People who spread such stupid jokes are actually either gay or sadists. Stop misleading others. Everytime I meet a group of boys, they just start talking rubbish regarding marriage. When will start your TODAY ? and How long will take to FUTURE ?